The most vital factor in weed management? Successful detection. How can drones fly to the rescue? Weeds have proven to be a massive agricultural pain point regardless of where you farm. Historically, weed detection involved visual inspection and manual crop scouting. Such approach deemed greatly inefficient and time-consuming for farmers managing vast arable lands. With the advent of drones and advanced data analysis, weed detection can now be done in a seamless and automated manner with PrecisionHawk’s new Weed Pressure analysis tool. 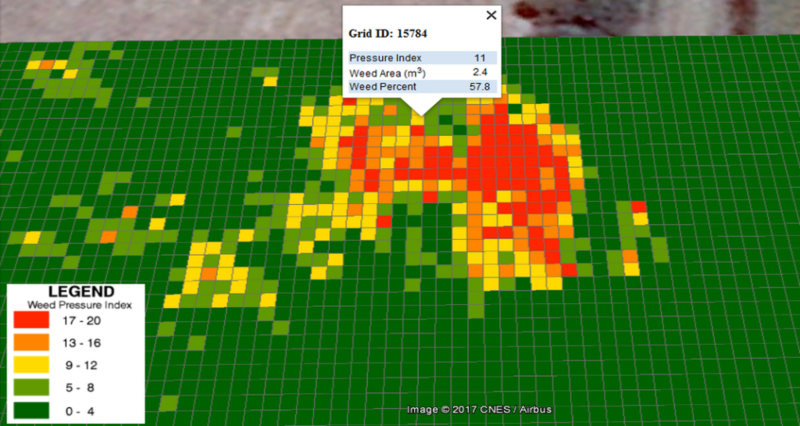 The Weed Pressure algorithm analyzes high resolution drone data to generate a weed pressure map, giving farmers a weed pressure index (ranging from 0 – 20) along with the percentage of weeds dispersed across the entire survey area. The algorithm ingests multispectral data (BGNIR) with a resolution of at least 5 cm/pixel. Farmers who own the right DJI Drone, for example, will have all the hardware and software requirements necessary to successfully run the Weed Pressure analysis tool.